Kansas alumni Joel Embiid has surgery on Saturday that successfully repaired an orbital bone fracture around his left eye. Later in the night, Embiid was able to watch his Jayhawks face the Villanova Wildcats and during the game, he decided to shoot another shot Rihanna's way. 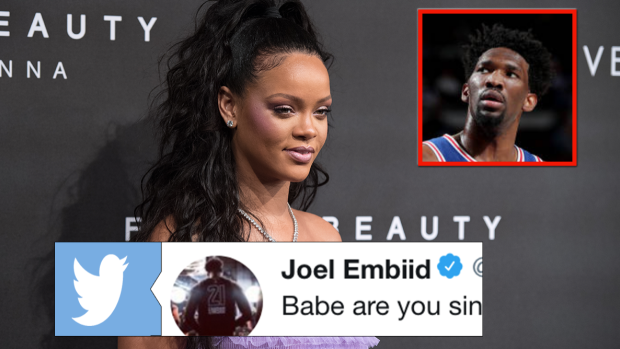 Back in 2014, Embiid tried to land a date with Rihanna by way of Twitter and it didn't work out. Embiid is an All-Star, so maybe his latest shot can land him a date with Rihanna. During the Final Four game, Embiid also admitted he was feeling the effects of the surgery from earlier in the day. Even when Embiid's injured he's entertaining, but we hope he recovers quickly so he can join the 76ers in the playoffs.